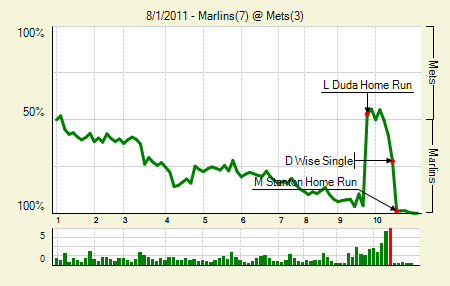 Moving the Needle: Lucas Duda ties the game with a homer in the bottom of the ninth, +.489 WPA. The Mets appeared to have a little magic last night, but it only lasted so long. They fell behind 3-0 early, but then Jason Bay put them on the board with a homer, his third of the year at home, which is as many as he had at home last year. 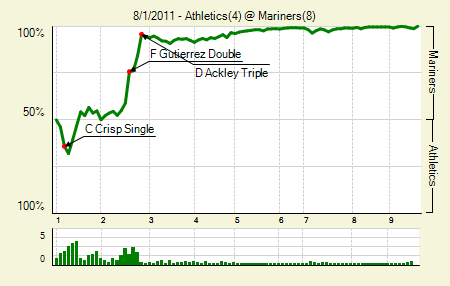 The 3-1 score persisted until the bottom of the ninth, when Angel Pagan doubled, and then, two batter later, Duda got a cookie. He whaled it over the fence in right-center to tie the game at three. But the next inning the Marlins loaded up the bases with one out, and Mike Stanton hit a homer of his own, effectively crushing the Mets chances. Javier Vazquez: 7 IP, 6 H, 1 R, 1 BB, 2 K. He’s given up more than three runs just once in his last nine starts. That’s the his fifth start in which he’s allowed zero or one runs, which is more than most people probably thought he’d have coming into the season. Omar Infante: 3 for 5, 1 3B. That’s his fourth triple in his last 11 games. Moving the Needle: Asdrubal Cabrera’s second two-run homer breaks the 5-5 tie in the eighth, +.284 WPA. Cabrera’s first homer was the stuff that makes for big WPA swings. With a runner on second and one out in the sixth he skied one out over the wall in right to give the Indians a 4-3 lead. 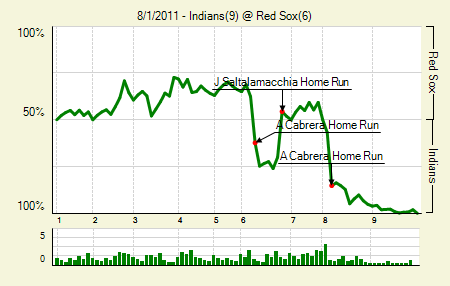 Travis Hafner followed that with a homer, but in the next inning the Sox got one of their own to tie. Then in the bottom of the eighth, Cabrera again hit one out to right. It bounced back onto the field and appeared to be in play at first, but a review cleared things up and the Indians had their lead back. Jason Kipnis: 3 for 5, 1 2B, 1 HR. That’s as many hits as he had in his first 24 PA.
Jarrod Saltalamacchia: 2 for 3, 1 2B, 1 HR. He hit the game-tying homer in the sixth. That’s his 10th on the year. He’s been huge for the Sox lately, raising his wOBA to around .350. Moving the Needle: John Mayberry ties the game with a two-run homer in the ninth, +.341 WPA. It appeared as though Colorado had this one in the bag. They led 3-1 heading into the ninth, and their closer, Huston Street, recorded the first two outs without incident. 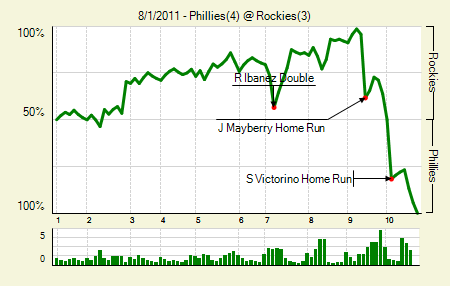 But then Carlos Ruiz doubled, and pinch-hitter Mayberry hit one a long way out to left, tying the game. It must have given Street flashbacks of the 2008 NLDS. Shane Victorino led off the next inning with a homer, which eventually gave the Phillies the W.
Jhoulys Chacin: 7.1 IP, 6 H, 1 R, 2 BB, 2 K. That’s his 10th start, out of 22, in which he’s allowed zero or one run. Seth Smith: 2 for 4, 1 HR. He’s just 30 PA away from his career high, so he’s definitely playing more of a role this year. Problem is, he’s still terrible against lefties. 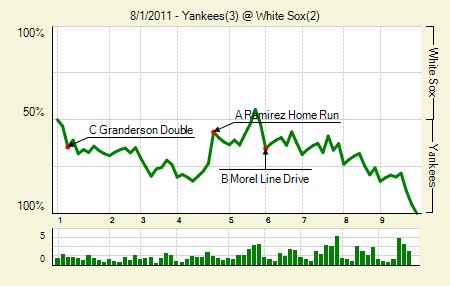 Moving the Needle: Alexei Ramirez connects for a two-run shot, +.168 WPA. The Yankees knocked around Jake Peavy early, getting three runs on six hits, including a pair of doubles, in the first three innings. The White Sox did fight back, most notably when Ramirez crushed one over the fence in left to make the score 3-2. But that’s all the scoring either team did. CC Sabathia: 8 IP, 10 H, 2 R, 0 BB, 6 K. That was only the seventh homer he’s allowed all season. Curtis Granderson: 2 for 4, 2 2B. His wOBA sits just under .400. 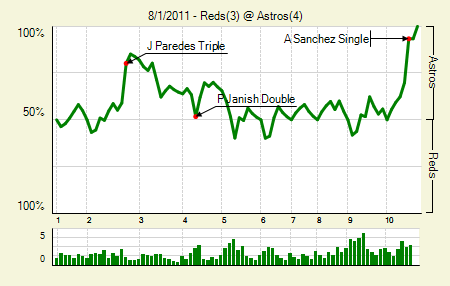 Moving the Needle: Angel Sanchez sets up the winning run in the 10th, +.235 WPA. You get serious credit if you recognized some of the names on Houston’s lineup card last night. But don’t let the lack of name value fool you; they still fought a hard nine. Well, they fought hard in one inning and picked up three runs, and then fought again in extra innings. Humberto Quintero led off with a single, and then Angel Sanchez moved him to third with another hit. After an intentional walk, Jose Altuve hit what appeared to the the game-winning single up the middle, but Paul Janish snagged it and gave his best throw home. Ryan Hanigan couldn’t hold on, though, and the Astros walked off winners. Jimmy Paredes: 1 for 4, 1 3B. He hit an RBI triple in his first MLB at-bat, after skipping AAA. Joey Votto: 2 for 4, 1 2B, 1 BB. The walk was intentional. He both drove in and scored a run, but one man can only do so much. Moving the Needle: Franklin Gutierrez puts the first run on the board, +.168 WPA. Trevor Cahill would like to forget the second inning, as the Mariners pushed across five runs. The first came off the bat of Gutierrez, whose opposite field double drove in one and set up some more. Cahill allowed seven runs total; it was the second time in three starts that he’s completely tanked. Dustin Ackley: 2 for 4, 1 2B, 1 3B, 1 BB. He drove in three with a triple in the second. With a wOBA now above .400, he remains one of the few bright spots on this team. Justin Smoak: 2 for 3, 1 2B, 1 BB. He didn’t start, but came in after Chone Figgins left with a strained hip flexor. That’s a nice little way to get something started. He hit just four doubles in July, and hasn’t homered since June 12th. Moving the Needle: Matt Holliday homers in the first, +.177 WPA. Things looked up from the get-go for the Cardinals, as they took an early 2-0 lead when Holliday hit one over the wall in the right field corner. The Brewers finally responded in the fifth, when they put five on the board in support of Zack Greinke. Nyjer Morgan: 2 for 5, 1 2B. He drove in three with a bases-clearing double in the fifth. Zack Greinke: 6 IP, 7 H, 2 R, 1 BB, 5 K. The Cardinals hit him at times, but he didn’t give in after the Holliday homer — though it did appear that Skip Schumaker was safe on the inning-ending double play, with the bases loaded, in the sixth. 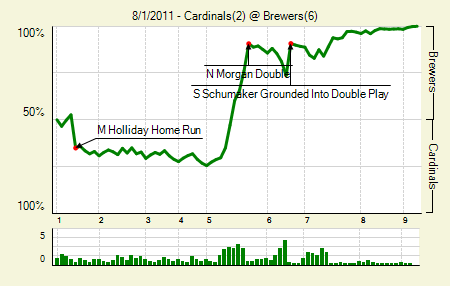 The favorable call ended the Cardinals’ rally. Moving the Needle: David Ross grounds into a bases-loaded double play, -.193 WPA. The Nats and Braves traded early runs on solo shots, but then in the second the Nats pitcher, Livan Hernandez, came through with the go-ahead hit. 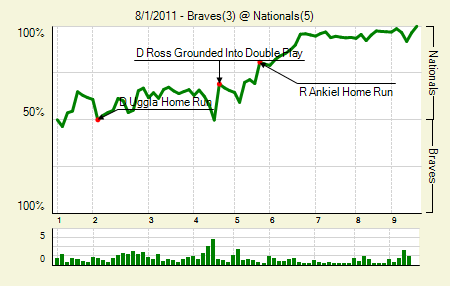 The Braves had a chance to avenge that in the fourth, when they loaded up the bases with one out. That brought up David Ross, who grounded one to short for a 6-4-3 twin killing to end the inning. The Braves hit into three double plays in the game. Dan Uggla: 3 for 4, 2 HR. That’s four homers in his last four games. The hit streak goes to 23 games. Rick Ankiel: 2 for 4, 2 HR. They were both solo shots, his fourth and fifth of the season. Before this he hadn’t hit two HRs within 20 PA of each other. 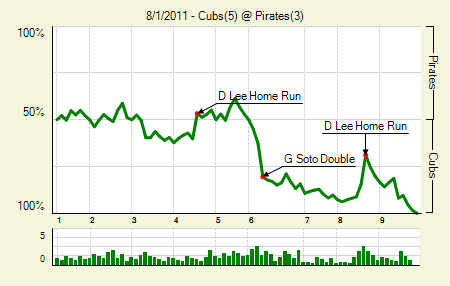 Moving the Needle: Geovany Soto’s double puts the Cubs up in the sixth, +.176 WPA. With men on first and second with none out in the sixth, Soto pulled one to left, bringing home the lead runner easily. The trail runner, Jeff Baker, nearly got nabbed at third, but he stuck around and scored two batters later. The Cubs scored twice on outs in that frame, extending their lead to 4-1. Derrek Lee: 2 for 4, 2 HR. After hitting four homers in his first 236 PA he’s hit 10 in his last 132. Carlos Zambrano: 6 IP, 7 H, 1 R, 3 BB, 5 K. That’s only the seventh time in 22 starts that he’s struck out at least five. This is starting to look like his 2008 season in many ways. Moving the Needle: Rod Barajas drives in the go-ahead run, +.121 WPA. 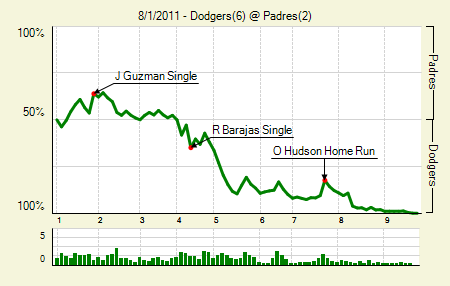 The Padres struck first, but the Dodgers struck most often. After falling behind 1-0 in the first they tied it in the second and then took the lead in the fourth, when Barajas blooped one into left. They scored another pair the next inning, giving them all the lead they’d need. Clayton Kershaw: 9 IP, 6 H, 2 R, 2 BB, 4 K. That’s the first time he’s struck out fewer than six in a start since June 14th. Matt Kemp: 2 for 4, 1 2B, 1 3B. He’s 16 for his last 36 with four doubles, a triple, and two homers. Moving the Needle: Miguel Montero ties the game with a single in the sixth, +.157 WPA. 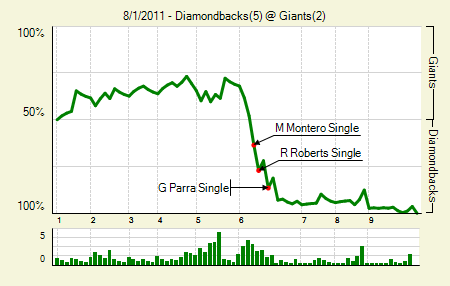 Down 1-0 heading into the sixth, the Diamondbacks got a big rally going. It started with a single and a walk, and then Montero grounded one through the hole in the right side for a game-tying base hit. Ryan Roberts followed with the go-ahead single, and then the Diamondbacks got three more en route to a victory over the NL West leaders. Cody Ross: 2 for 4, 1 HR. He got the Giants on the board early with his homer. He played center, which seems odd at this point in his career. Ian Kennedy: 8 IP, 6 H, 2 R, 1 BB, 7 K. A pair of solo homers was all the damage he allowed. In his last four starts he’s gone 28 IP, 19 H, 6 R, 7 BB, 28 K.
We hoped you liked reading The Morning After: Game Recaps for August 1st by Joe Pawlikowski! Phils actually played the Brewers in the 2008 nlds. Street screwed the pooch in 09.